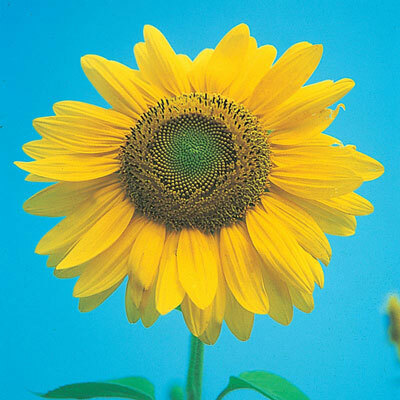 Mammoth Gray Stripe Sunflower | Henry Field's Seed & Nursery Co. Enormous yellow flowers measure 14 in. across and yield a whopper crop of seeds! High oil content makes for great roasted flavor. Grows 9-12 ft. tall. 100 DAYS. Height 9 - 12 feet. Germination 10 - 14 days at 68 - 86 degrees F.
Height: 9 - 12 feet. Spacing: 2 - 4 feet. Spread: 15 - 24 inches. Foliage: Very rough; to 1 foot long heart-shaped green leaves. Flower Form: Bright yellow flowers up to 20 inches in diameter. Soil Requirements: Light, well-drained, dry soil. Seed Count: Approximately 300 seeds per ounce. 1/4 lb. is approximately 1200 seeds. Sold by weight. Size: 8 - 14 inch flowers.